Just a 10-minute walk from Churaumi Aquarium is the small village of Bise, an area where there are still old-fashioned landscapes typical of Okinawa. Here, a green archway made of around 20,000 fukugi trees lined in a row welcomes visitors into an alley of white sand. The fukugi tree, written as ‘福木’ in kanji which means ‘lucky tree’, is an evergreen tree native to the Philippines. They grow straight up reaching a height of more than 15 metres, and because they have strong bark and leaves, they were planted in forests as a way of protecting against typhoons and fires. They are also strong against salt damage making them useful for villages which are close to the sea, such as Bise. 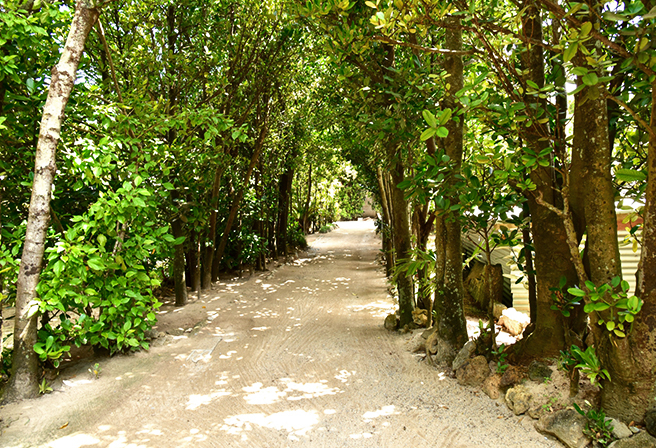 These trees were planted as a way of protecting the area, but today the sunlight which trickles through the trees onto a soft, sandy road creates a sense of relief for those who stroll down it, helping to heal the tourists who pay a visit. The rows of fukugi trees stretch for around 1 kilometer, and it is fun to rent a bike and cycle down the alley or take a ride in an ox-drawn cart. One of the trees is estimated to be around 300 years old. Visitors should try to remember that Bise is still a village with 250 homes where people live and carry out their daily lives. Please avoid shouting and entering private property. Beautiful Contrast made by the Okinawan Weather, the Red Roof Tile.